Based on the idea of Mirage, described as a naturally occurring optical phenomenon in which light rays are bent to produce a displaced image of distant objects or the sky, the team that designed the Croatian Pavilion for the Venice Biennale decided to create a floating pavilion to present arts and architecture of Croatia at the Venice Biennale. Following the same principles of a Fata Morgana, which is an unusual and very complex form of Mirage that can be seen in a narrow band right above the horizon, the Floating Pavilion is constructed on an existing barge with dimensions of 10m x 20m x 3m. It is designed by a group of 14 leading Croatian architects, who have made the recent Croatian architecture visible on the global scene. Instead of working in the usual formats of their practices and presenting speculative projects, they decided to work together on a single proposal and to have it constructed and towed toward its final destination in Venice right away. The pavilion structure is the barge’ cargo. The cargo presented here maps the process of intense interaction between architects working on the common project, their collaboration with the Croatian maritime industry, and the extraordinary act of architecture it produced. 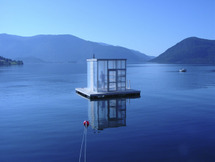 The floating pavilion is built on an existing barge with dimensions of 10m x 20m x 3m. The pavilion structure is in the form of a cargo of 32 tons of welded wire mesh, with more than 40 layers spaced so that they form a solid volume with approximate dimensions of 19m x 9m x 5,5m. Inside the volume is a carved out space shaped by varying contours that form the main space as well as protrusions and openings toward the outside. Almost invisible form a distance, the structure reveals itself with different densities of steel mesh, transparencies, and vision lines, forming stunning visual effects and experience of space by very simple means. 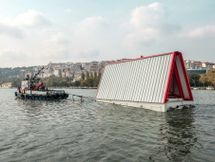 The Croatian pavilion is towed by a tugboat from the shipyard in Kraljevica to the port of Rijeka, to be presented to the public on 21 August 2010, and on to Venice to be moored at the main pier during the opening of the Biennale. Inside the Croatian exhibition space, the project documentation center has been set up in the form of cargo boxes printed with the records of the design process, the construction of the pavilion at the 280-year-old shipyard in Kraljevica, and its journey across the Adriatic. Lana Cavar and Narcisa Vukojević are responsible for graphic design of the exhibition, while Vjeran Šalomon made audio installation. The authors of the project are 15 of the most distinguished Croatian architects of today. Here they have united into a single work team that has produced a common project and had it realized for the Croatian participation at La Biennale. Saša Begović, Marko Dabrović, Igor Franić,Tanja Grozdanić, Petar Mišković,Silvije Novak, Veljko Oluić, Helena Paver Njirić, Lea Pelivan, Toma Plejić,Goran Rako, Saša Randić, Idis Turato, Pero Vuković and Tonči Žarnić met in more than 20 work sessions and innumerable other meetings and site visits.